Maria Theresa of Naples and Sicily (6 June 1772 – 13 April 1807) was the last Holy Roman Empress and the first Empress of Austria by marriage to Francis II, Holy Roman Emperor. She was the eldest daughter of Ferdinand IV & III of Naples and Sicily (later Ferdinand I of the Two Sicilies) (1751–1825) and Marie Caroline of Austria (1752–1814). Born Maria Teresa, and named after her maternal grandmother Maria Theresa of Austria, she was the eldest of 17 children born to her parents, the King and Queen of Naples and Sicily. She was her mother's favourite child from birth until she left the Neapolitan court to marry. In February 1790, Archduke Francis of Austria's first wife, Duchess Elisabeth of Württemberg, died in childbirth, and it was announced that he would marry one of the princesses of Naples. This was in accordance with the traditional Habsburg marriage policy. Maria Theresa and her sister Princess Luisa of Naples and Sicily were both considered for the match. In the end, Luisa was chosen to marry Ferdinand III, Grand Duke of Tuscany instead, and Maria Theresa to marry Francis. On 15 September 1790 she married her double first cousin, who would in 1792 become Holy Roman Emperor Francis II, and in 1806 Emperor Francis I of Austria. The marriage is described as a happy one based on good mutual understanding, despite differences in personality. Francis was described as a melancholic character, shy and reserved, serious and with a preference for a spartan lifestyle and duty, and with a pale and haggard appearance. Maria Theresa, on the other hand, was described as a gracious blue-eyed blonde with full lips, but a large nose, with a vivacious personality, a hot temper and a sensual nature. Despite these differences in appearance and personality, however, they were reported to have a good understanding of each other and had a very good relationship. 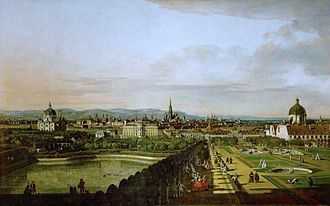 Maria Theresa reportedly adapted well to her new home in Vienna and did not suffer from homesickness. She loved entertainment, and participated with enthusiasm in court life, and it was noted that she enjoyed dancing, participating in every carnival ball at court even while pregnant. She particularly enjoyed the Waltz, which had been recently introduced as an innovation and became fashionable during her life in Vienna. The Empress is reputed to be so jealous that she does not allow him to take part in social life or meet other women. Vicious tongues accuse her of being so passionate that she exhausts her consort and never leaves him alone even for a moment. Although the people of Vienna cannot deny that she is gifted, charitable and carries herself beautifully, she is disliked for her intolerance and for forcing the Emperor to live isolated from everyone. She is also accused of interesting herself in unimportant matters and socializing exclusively with her lady-companions. With them she spends her evenings singing, acting out comedies and being applauded. "He saw the Emperor sitting on a bench, alone in his thoughts. Immediately, the Empress came to fetch him, and he exlaimed: "Can't you ever leave me alone, so that I may breathe for one moment? For God's sake, don't follow me around all the time." Empress Maria Theresa was interested in politics and came to play a certain role in state affairs due to her influence over her spouse, to whom she acted as an adviser. 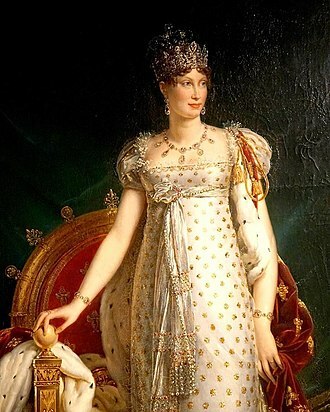 She was a conservative force and belonged to the critics of Napoleon I, and was reported to have encouraged Francis in an anti-French position during the Napoleonic Wars. She has also been pointed out for being partially responsible for the dismissal of Johann Baptist Freiherr von Schloissnigg and Graf Franz Colloredo. An important patron of Viennese music, she commissioned many compositions for official and private use. Joseph Haydn wrote his Te Deum for chorus and orchestra at her request. Her favourite composers included Paul Wranitzky and Joseph Leopold Eybler, a composer of sacred music. She died due to complications after her last premature childbirth. 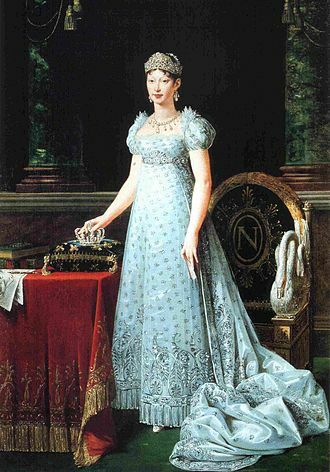 Archduchess Marie Louise 12 December 1791 17 December 1847 (aged 56) Married first Emperor Napoleon I of France, had issue, married second Adam, count of Neipperg, had issue, married third to Charles, Count of Bombelles, no issue. Emperor Ferdinand I of Austria 19 April 1793 29 June 1875 (aged 82) Married Maria Anna of Savoy, Princess of Sardinia, no issue. Archduchess Maria Caroline 8 June 1794 16 March 1795 (aged 0) Died in childhood, no issue. Archduchess Caroline Josepha Leopoldine 22 January 1797 11 December 1826 (aged 29) Renamed Maria Leopoldina upon her marriage; married Pedro I of Brazil, had issue. Archduchess Maria Clementina Franziska Josepha 1 March 1798 3 September 1881 (aged 83) Married her maternal uncle Leopold, Prince of Salerno, had issue. Archduke Joseph Franz Leopold 9 April 1799 30 June 1807 (aged 8) Died some weeks after his mother in childhood, no issue. Archduchess Marie Caroline 8 April 1801 22 May 1832 (aged 31) Married Crown Prince (later King) Frederick Augustus II of Saxony, no issue. Archduke Franz Karl 17 December 1802 8 March 1878 (aged 75) married Princess Sophie of Bavaria; father of Franz Joseph I of Austria and Maximilian I of Mexico. Archduchess Marie Anna 8 June 1804 28 December 1858 (aged 54) Born intellectually disabled (like her eldest brother, Emperor Ferdinand I) and to have suffered from a severe facial deformity. Died unmarried. Lusatia is a region in Central Europe. The region is the home of the group of Lusatian Sorbs. Historically, Lusatia belonged to different countries. Being part of the Lands of the Bohemian Crown for three hundred years, alongside them it passed to the Habsburg Monarchy and from it to the Electorate of Saxony, the greater part passed to the Kingdom of Prussia in 1815 and the whole region merged into Germany in 1871. In the Polish part today Polish is spoken, and in the German part German, Upper-, the biggest Lusatian town is Cottbus. The name derives from the Sorbian word łužicy meaning swamps or water-hole, Lusatia is the Latinised form which spread in the English and Romance languages area. Lusatia comprises two both scenically and historically different parts, a hilly southern section and a lower region. Neighbouring regions were Silesia in the east, Bohemia in the south, the Margraviate of Meissen and the Duchy of Saxe-Wittenberg in the west as well as the Margraviate of Brandenburg in the north. Upper Lusatia is today part of the German state of Saxony, except for a part east of the Neisse River around Lubań. Among those villages are Niedercunnersdorf, Wehrsdorf, Sohland an der Spree with Taubenheim, most of the area belonging to the German state of Brandenburg today is called Lower Lusatia and is characterised by forests and meadows. In the course of much of the 19th and the entire 20th century, it was shaped by the lignite industry, important towns include Cottbus, Eisenhüttenstadt, Lübben, Lübbenau, Finsterwalde, and Żary, which is now considered the capital of Polish Lusatia. Between Upper and Lower Lusatia is a called the Grenzwall, literally meaning border dyke. In the Middle Ages this area had forests, so it represented a major obstacle to civilian. Some of the villages were damaged or destroyed by the open-pit lignite mining industry during the DDR era. The Lusatian Lake District will become Europes largest artificial lake district, some of the biggest lakes are Lake Senftenberg and Bluno Southern Lake. From 1804 to 1918 it was a crownland of the Austrian Empire. 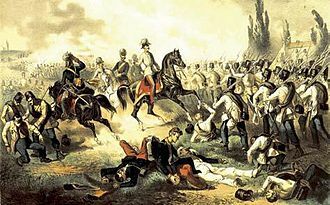 After the reforms of 1867, it became an ethnic Pole-administered autonomous unit under the Austrian crown, the country was carved from the entire south-western part of the Polish–Lithuanian Commonwealth. Among the many titles of the princes of Hungary was ruler of Galicia and Lodomeria. The name Galicia is the Latinized form of Halych, a principality of the medieval Ruthenia, Lodomeria, is a Latinized form of Volodymyr-Volynsky that was founded in the 10th century by the Vladimir the Great and until the partitions of Poland was known simply as Volodymyr. King of Galicia and Lodomeria was a title that King of Hungary adopted during his conquest of the region back in the 12th century. This historical region in Eastern Europe is divided today between Poland and Ukraine, the nucleus of historic Galicia consists of the modern Lviv and Ivano-Frankivsk regions of western Ukraine. In 1772, Galicia was the largest part of the area annexed by the Habsburg Monarchy in the First Partition of Poland. As such, the Austrian region of Poland and what was to become Ukraine was known as the Kingdom of Galicia and Lodomeria to underline the Hungarian claims to the country. However, after the Third Partition of Poland, a portion of the ethnically Polish lands to the west was added to the province. During the first decades of Austrian rule, Galicia was firmly governed from Vienna, the aristocracy was guaranteed its rights, but these rights were considerably circumscribed. The former serfs were no longer mere chattel, but became subjects of law and were granted personal freedoms. 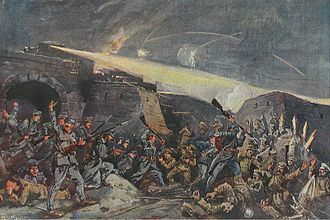 Their labour obligations were defined and limited, and they could bypass the lords, at the same time, the Austrian Empire extracted from Galicia considerable wealth and conscripted large numbers of the peasant population into its armed services. 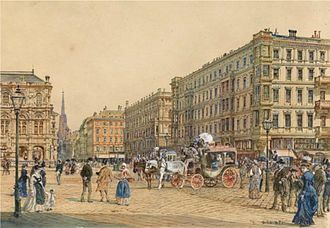 The 1820s and 1830s were a period of bureaucratic rule overseen from Vienna, most administrative positions were filled by German-speakers, including German-speaking Czechs, although some of their children were already becoming Polonized. The Duchy of Bukovina was a constituent land of the Austrian Empire from 1849 and a Cisleithanian crown land of Austria–Hungary from 1867 until 1918. Another German name for the region, das Buchenland, is used in poetry. In Romanian, in literary or poetic contexts, the name Țara Fagilor is sometimes used, in English, an alternative form is The Bukovina, increasingly an archaism, however, is found in older literature. After the Mongol invasion of Europe, the Bukovina lands since the 14th century had been part of the Principality of Moldavia, in the 16th century, Moldavia came under Ottoman influence, but still retaining its autonomy. 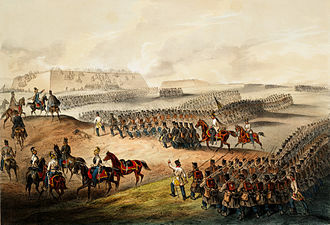 During the early 18th century, Moldavia became the target of the Russian Empires southwards expansion, in 1769, during the Russo-Turkish War of 1768–74, Moldavia was occupied by Russian troops. Following the First Partition of Poland in 1772, the Habsburg Monarchy had aimed at a connection from the Principality of Transylvania to the newly acquired Kingdom of Galicia and Lodomeria. On 2 July 1776, at Palamutka and Ottomans signed a convention, Austria giving back 59 of the previously occupied villages. For opposing and protesting the annexation of the part of Moldavia by the Habsburg Empire. So far, the Moldavian nobility had traditionally formed the class in that territory. In the mid 19th century the town of Sadhora became the centre of the Hasidic Sadigura dynasty, the immigration process promoted the further economic development of the multi-ethnic country, though it remained a remote eastern outpost of the Danube Monarchy. 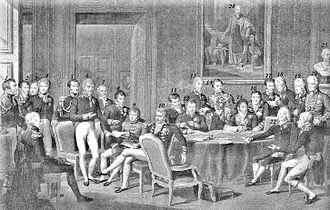 In 1804, the became part of the newly established Austrian Empire. After the political turmoil of the 1848 revolutions, the estates urged the Vienna government to elevate the Bukovina to a separate Austrian Kronland. With effect of 4 March 1849, the former Kreis was declared the Herzogtum Bukowina and it was governed by a k. k. Statthalter appointed by the emperor, with his residence at Czernowitz from 1850. In 1860 the Bukovina was again amalgamated with Galicia, but reinstated as a province once again according to the 1861 February Patent issued by Emperor Franz Joseph I.
Dubrovnik is a Croatian city on the Adriatic Sea, in the region of Dalmatia. It is one of the most prominent tourist destinations in the Mediterranean Sea, a seaport, in 1979, the city of Dubrovnik joined the UNESCO list of World Heritage Sites. After repair and restoration works in the 1990s and early 2000s, the names Dubrovnik and Ragusa co-existed for several centuries. The name Dubrovnik of the Adriatic city is first recorded in the Charter of Ban Kulin. It is mostly explained as a Slavic name of the type, referring to an oak grove or oak forest. The historical name Ragusa is recorded in the Greek form Ῥαούσιν in the 10th century and it was recorded in various forms in the medieval period, Lavusa, Raugia, Rachusa. Various attempts have been made to etymologize the name, a connection to the name of Sicilian Ragusa has been proposed. The classical explanation of the name is due to Constantine Porphyrogenituss De Administrando Imperio, the name is explained as a corruption of Lausa, the name of the rocky island on which the city was built. Excavations in 2007 revealed a Byzantine basilica from the 8th century, the size of the old basilica clearly indicates that there was quite a large settlement at the time. There is evidence for the presence of a settlement in the pre-Christian era, after the fall of the Ostrogothic Kingdom, the town came under the protection of the Byzantine Empire. Dubrovnik in those medieval centuries had a Roman population, after the Crusades, Dubrovnik came under the sovereignty of Venice, which would give its institutions to the Dalmatian city. After a fire destroyed almost the whole city in the night of August 16,1296, by the Peace Treaty of Zadar in 1358, Dubrovnik achieved relative independence as a vassal-state of the Kingdom of Hungary. Between the 14th century and 1808, Dubrovnik ruled itself as a state, although it was a vassal from 1382 to 1804 of the Ottoman Empire. The Republic reached its peak in the 15th and 16th centuries, for centuries, Dubrovnik was an ally of Ancona, the other Adriatic maritime republic rival of Venice, which was the Ottoman Empires chief rival for control of the Adriatic. The Hofburg is the former imperial palace in the centre of Vienna, Austria. It was the principal winter residence, as Schönbrunn Palace was the summer residence. Since 1279 the Hofburg area has been the seat of government. The Hofburg has been expanded over the centuries to various residences, the imperial chapel, the imperial library, the treasury, the Burgtheater, the Spanish Riding School. The palace faces the Heldenplatz ordered under the reign of Emperor Francis Joseph I, as part of what was planned to become the Kaiserforum, the name translates as Royal Castle, which denotes its origins when it was initially constructed during the Medieval Age. 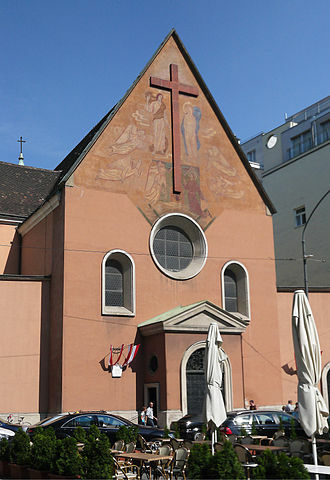 Initially constructed as the seat of the Dukes of Austria in the 13th century, from 1438 to 1583 and from 1612 to 1806, it was the seat of the Habsburg kings and emperors of the Holy Roman Empire, thereafter the seat of the Emperor of Austria until 1918. It has continued its role as the seat of the head of state and is used by the Austrian Federal President. It is the permanent conference seat of the Organization for Security, presently the Burghauptmannschaft is under the jurisdiction of the Federal Ministry of Economy. 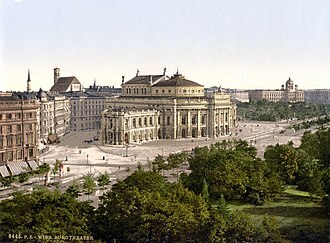 In September 1958 parts of the Hofburg were opened to the public as a convention centre, in the first ten years the Burghauptmannschaft operated the convention centre, since 1969 a private company has been managing the international congress and events center. Every year the centre hosts about 300 to 350 events with around 300,000 to 320,000 guests. Among the events are conventions and meetings as well as banquets, trade fairs, the oldest sections originate from the 13th century and were primarily constructed by the last of the Babenbergers or by Ottakar II of Bohemia. 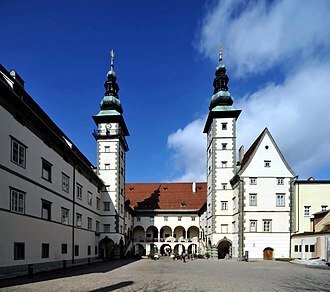 Previously the castle of the Austrian rulers had been located on the square called Am Hof, the castle had a square-shaped outline with four turrets, surrounded by a moat and a drawbridge that led to the inside. These oldest sections of the castle form the Swiss Court. The Margraviate of Moravia or March of Moravia was a marcher state existing from 1182 to 1918 and one of the lands of the Bohemian Crown. It was officially administrated by a margrave in cooperation with a provincial diet and it was variously a de facto independent state, and subject to the Duchy, the Kingdom of Bohemia. It comprised the region called Moravia within the modern Czech Republic, the Margraviate lay east of Bohemia proper, with an area about half that region’s size. In the north, the Sudeten Mountains, which extend to the Moravian Gate, formed the border with the Polish Duchy of Silesia, in the east and southeast, the western Carpathian Mountains separated it from present-day Slovakia. In the south, the winding Thaya River marked the border with the Duchy of Austria, usually considered a Czech people that speak Moravian dialects, made up the main part of the population. According to a 1910 Cisleithanian census,27. 6% identified themselves as German Moravians and these ethnic Germans would be expelled after the Second World War. 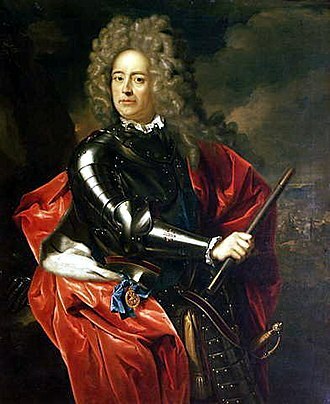 Other ethnic minority groups included Poles and Slovaks, King Otto I of Germany officially granted it to Duke Boleslaus I in turn for his support against the Hungarian forces in the 955 Battle of Lechfeld. As heir apparent, the future King Ottokar II of Bohemia was appointed Moravian margave by his father Wenceslaus I in 1247, along with Bohemia, Moravia was ruled by the House of Luxembourg from the extinction of the Přemyslid dynasty until 1437. Jobst, nephew of Emperor Charles IV inherited the Margraviate in 1375, shaken by the Hussite Wars, the Moravian nobles remained loyal supporters of the Luxembourg emperor Sigismund. The rivalry with King Vladislaus II was settled in the 1479 Peace of Olomouc, whereby Matthias renounced the royal title but retained the rule over the Moravian lands. With the other lands of the Bohemian Crown, the Margraviate was incorporated into the Habsburg Monarchy upon the death of King Louis II in the 1526 Battle of Mohács, Moravia was ruled as a crown land within the Austrian Empire from 1804 and within Cisleithanian Austria from 1867. Kotor is a coastal town in Montenegro. It is located in a part of the Gulf of Kotor. The city has a population of 13,510 and is the center of Kotor Municipality. The old Mediterranean port of Kotor is surrounded by fortifications built during the Venetian period and it is located on the Bay of Kotor, one of the most indented parts of the Adriatic Sea. Some have called it the southern-most fjord in Europe, but it is a ria, together with the nearly overhanging limestone cliffs of Orjen and Lovćen, Kotor and its surrounding area form an impressive and picturesque Mediterranean landscape. In recent years, Kotor has seen an increase in tourists. Visitors are attracted both by the beauty of the Gulf of Kotor and by the old town of Kotor. Kotor is part of the World Heritage Site dubbed the Natural and Culturo-Historical Region of Kotor and it is located in a secluded part of the Gulf of Kotor. Kotor has a subtropical climate. Kotor, first mentioned in 168 BC, was settled during Ancient Roman times, Kotor has been fortified since the early Middle Ages, when Emperor Justinian built a fortress above Acruvium in 535, after expelling the Ostrogoths. This town was named as Kotor in 9th century and it is possible that the vase derives from the notion of vassal and possessive adjective cataro. One can not exclude the possibility that the Vasekatro was a refuge and/or settlement of Katars because they have the root of vase Latin term for the noun vase. When, according to Mihajlo Solinjanin, arrived in Risan, announced their intention to raise the fortress in which to be sure. When they learned citizens of the settlement Ascrivium, urged that the planned cost of investing in the construction of a current city, and that combined live as true friends and citizens. These are not accepted by Ascrivians, or later, under the influence of its bishops are agreed to throw the draw, and Draw outbursts in favor of Kotors Bosnians. The city was plundered by the Saracens in 840, Kotor was one of the more influential Dalmatian city-states of romanized Illyrians throughout the Middle Ages, and until the 11th century the Dalmatian language was spoken in Kotor. Galician Sejm (parliament) in Lemberg (modern Lviv). The Vice-regency Office in Lemberg (modern Lviv, since 1880). Entrance of old town Kotor with post-World War II sign "What belongs to others we don't want, ours we don't give." View of Kotor from Castle Of San Giovanni. Arrival of Archduchess Leopoldina in Rio de Janeiro, 5 November 1817.